I’ll be honest. I think every gardener needs a winter break – especially following a successful gardening season. Overall, 2017 was an excellent season. The zinnias were spectacular! We had a decent harvest of fresh herbs and greens, tomatoes, and peppers. The wine cork mulch project far exceeded expectations! 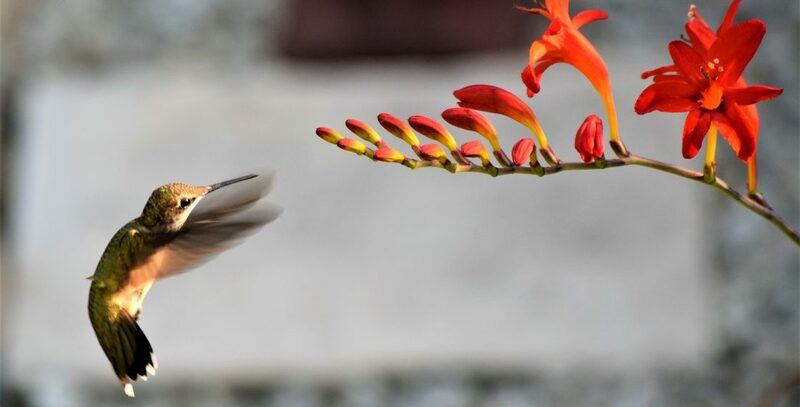 And the hummingbirds arrived and departed exactly as expected – delighting us every single day during their nearly 6 month visit. And here it is, late November and I’m just sharing some of the 2017 stories now. My original intent with my ‘Garden with Grace’ blog was to document each growing season – in detail. That said, while I’ve had the best of intentions, as well as at least a dozen gardening stories (constantly!) in my head, I’m not as consistent with sitting down to write during the summer months. It’s amazing how a basic mobile phone camera can create such detailed photos of flowers and in some cases, insects. I don’t use any filters on my Instagram photos, so what you see, is what I see. On the days I’m searching for inspiration, I scroll through my Instagram feed to either write, plan for next year’s garden, or just remember past moments in the garden. So my documentation of each gardening season is, indeed, getting done. Not in the way initially intended or planned, but it works nonetheless….very much like the actual act of gardening, itself. Categories: Autumn, Gardening Inspiration, Uncategorized | Tags: #bloominginmygardennow, flowers, Gardening, hashtag, instagram, intentions, Nashua, NH, planning | Permalink.